(Nanowerk News) Globular clusters are vast, spherical clouds of old stars bound together by gravity. They are found circling the cores of galaxies, as satellites orbit the Earth. These star clumps contain very little dust and gas — it is thought that most of it has been either blown from the cluster by winds and explosions from the stars within, or stripped away by interstellar gas interacting with the cluster. Any remaining material coalesced to form stars billions of years ago. 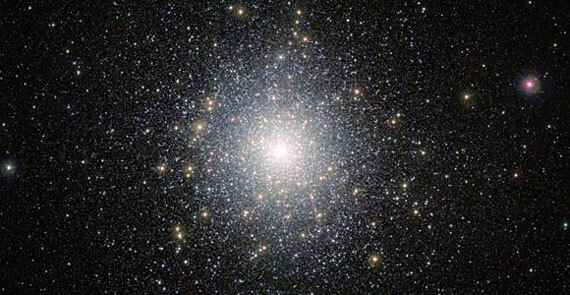 This new infrared image from ESO’s VISTA telescope shows the globular cluster 47 Tucanae in striking detail. This cluster contains millions of stars, and there are many nestled at its core that are exotic and display unusual properties. Studying objects within clusters like 47 Tucanae may help us to understand how these oddballs form and interact. This image is very sharp and deep due to the size, sensitivity, and location of VISTA, which is sited at ESO's Paranal Observatory in Chile. These globular clusters spark a considerable amount of interest for astronomers — 47 Tucanae, otherwise known as NGC 104, is a huge, ancient globular cluster about 15 000 light-years away from us, and is known to contain many bizarre and interesting stars and systems. Located in the southern constellation of Tucana (The Toucan), 47 Tucanae orbits our Milky Way. At about 120 light-years across it is so large that, despite its distance, it looks about as big as the full Moon. Hosting millions of stars, it is one of the brightest and most massive globular clusters known and is visible to the naked eye . In amongst the swirling mass of stars at its heart lie many intriguing systems, including X-ray sources, variable stars, vampire stars, unexpectedly bright “normal” stars known as blue stragglers (eso1243), and tiny objects known as millisecond pulsars, small dead stars that rotate astonishingly quickly . Red giants, stars that have exhausted the fuel in their cores and swollen in size, are scattered across this VISTA image and are easy to pick out, glowing a deep amber against the bright white-yellow background stars. The densely packed core is contrasted against the more sparse outer regions of the cluster, and in the background huge numbers of stars in the Small Magellanic Cloud are visible. This image was taken using ESO’s VISTA (Visible and Infrared Survey Telescope for Astronomy) as part of the VMC survey of the region of the Magellanic Clouds, two of the closest known galaxies to us. 47 Tucanae, although much closer than the Clouds, by chance lies in the the foreground of the Small Magellanic Cloud (eso1008), and was snapped during the survey. VISTA is the world’s largest telescope dedicated to mapping the sky. Located at ESO’s Paranal Observatory in Chile, this infrared telescope, with its large mirror, wide field of view and sensitive detectors, is revealing a new view of the southern sky. Using a combination of sharp infrared images — such as the VISTA image above — and visible-light observations allows astronomers to probe the contents and history of objects like 47 Tucanae in great detail.